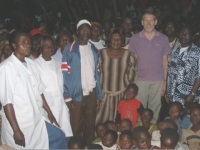 In November 2007 Peter Hearn, a GP from Bournemouth, UK, made a volunteer trip through AidCamps International to work as a doctor in a rural health clinic in the village of Lui, Oku sub-division in Cameroon, West Africa. Peter lived with a local village family, a great way of getting to know the villagers and their way of life. He enjoyed wonderful hospitality and friendliness throughout the village. There was a 'Welcome' ceremony, complete with Juju dancers and at the end of the placement there were speeches and gifts in a tropical rainstorm. In this village he worked with nurses who usually ran the clinic alone. They had never had a doctor working there before. 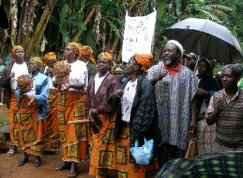 The clinic served the village and several surrounding ones with a total population said to be around 20,000, resulting in long queues every day. The idea for this charity arose from these experiences. In the developing world healthcare systems are inevitably focused on urban areas where the population is most concentrated. It is enormously expensive to provide a universal healthcare system such as we have in the UK, and for many governments in developing countries this is beyond their means. 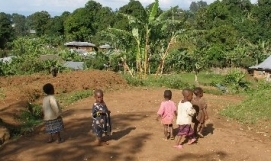 Many people in rural areas have difficulties accessing healthcare. Whilst on this volunteer placement, it occurred to Peter that the need in rural areas is for fundamental and basic healthcare and that this can be provided by a well trained nurse and midwife, with access to doctors when needed. This charity is, therefore, founded on the belief that we can best contribute to the wider spread of health by sponsoring local people to train as health professionals to work in their own communities. The involvement of the community is vital in the selection of a candidate, to give support during training and then employment in the local health clinic once qualified. This involvement will lead to more sustainable long term development of rural healthcare. It is expected that once qualified and experienced, these health professionals will accept future students for training attachments with them in their village health clinics.